Internet News Topics including social networks, online publications, blogs, Web sites, ebusiness, ecommerce, and related Internet culture news. 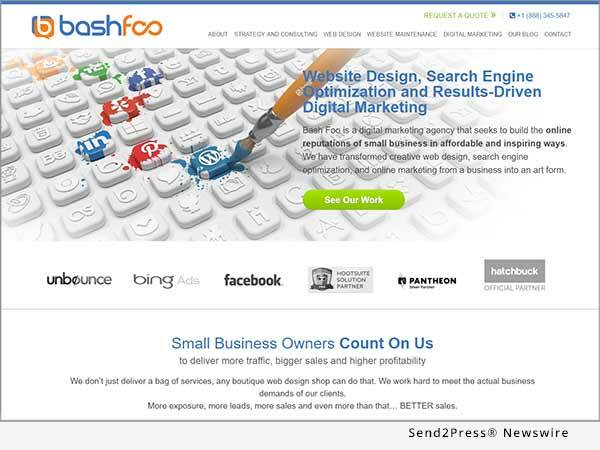 DAYTON, Ohio, May 15, 2016 (SEND2PRESS NEWSWIRE) — Bash Foo is a digital marketing agency that regularly launches websites and digital marketing strategies and campaigns for a national client base of small to medium sized businesses. Bash Foo recently launched its own new website showcasing best practices in web design, development, SEO and inbound marketing. SAN FRANCISCO, Calif., Nov. 18, 2015 (SEND2PRESS NEWSWIRE) — SmartStops, an online service that helps investors of all levels manage investment risk, announced today that it has extended its relationship with BNP Paribas and is now available to investors in the Italian market. IRVINE, Calif., Oct. 12, 2015 (SEND2PRESS NEWSWIRE) — For the first time since its launch in 2009, Living Textiles Baby and Kids, the innovative textiles and design baby and kids brand, is relaunching their own website, livingtextiles.com. This initiative will provide Living Textiles and Baby a larger platform to expand and grow its ecommerce. ALEXANDRIA, Va., April 14, 2015 (SEND2PRESS NEWSWIRE) — The emerging Internet of Things (IoT) will expose the global aviation industry to vulnerabilities at a level never before seen and will have a transformative impact on the industry, according to George M. Schu, a cybersecurity strategist with Stangarone and Associates, a Washington D.C.-based consultancy. LOS ANGELES, Calif., March 25, 2015 (SEND2PRESS NEWSWIRE) — Online retailer SensibleHerbs announced its launch at Natural Products Expo West fulfilling increased demand for discount herbs and supplements nation-wide. BANGALORE, India, March 10, 2015 (SEND2PRESS NEWSWIRE) — Remo Software, an Open Interconnect Consortium Member and developer of multi-platform apps, just released the 2.0 version of Remo MORE at Mobile World Congress (MWC) 2015, Barcelona. CHARLOTTE, N.C., March 3, 2015 (SEND2PRESS NEWSWIRE) — Everyone wants their own little piece of paradise and that’s exactly what a new global, online media magazine – Lucky Paradise Casinos – delivers. Is it about casinos? No, not really. It’s about feeling good and being lucky. SEATTLE, Wash., Feb. 10, 2015 (SEND2PRESS NEWSWIRE) — Seattle-based Georgian Wood Toys is making its entire collection of beautiful handmade wooden toys available nationally via its new online store. The old-world style toys, made in the country of Georgia, on the Black Sea, are sold exclusively in North America by the Seattle company. OCEANSIDE, Calif., Dec. 18, 2014 (SEND2PRESS NEWSWIRE) — In an ongoing effort to continually provide a unique jewelry shopping experience centered on consumer education, Master Jeweler Chad Elliott and the certified gemologist staff at Oceanside Jewelers are pleased to announce the release of their upgraded mobile-responsive web site. SALT LAKE CITY, Utah, Dec. 12, 2014 (SEND2PRESS NEWSWIRE) — North Capital Investment Technology has released TransactAPI 2.0, the first comprehensive transaction platform for funding portals, broker-dealers and private issuers. BOULDER, Colo., Nov. 12, 2014 (SEND2PRESS NEWSWIRE) — Voting is now open for the ‘Sports Feel Good Story of the Year’ contest, sponsored by TeamSnap and Sports Feel Good Stories. The contest recognizes inspiring athletes, coaches and fans from around the world. Voting ends Nov. 30, 2014, and winners will be announced in December. NEWS: Newly launched Jovare brings 100-percent hand crafted and unique jewelry to the U.S.
FOOTHILL RANCH, Calif., Nov. 10, 2014 (SEND2PRESS NEWSWIRE) — Introducing Jovare, a collection of handcrafted, affordable jewelry from Africa that caters to the woman who wants a distinctive look. Suitable for both casual and formal wear, the jewelry will be sold online exclusively at jovare.com. It will not be available in retail stores. NEWS: VegasTourism.com – The Budget Traveler’s Guide to Las Vegas! CHARLOTTE, N.C., Aug. 20, 2014 (SEND2PRESS NEWSWIRE) — NOMOREHEX (nomorehex.org), the online resource for trivalent chromium technology, has been launched to alert manufacturers and electroplaters of the pending European mandate banning the use of hexavalent decorative chromium chemistry in virtually all products finished in or exported into the EU.